Watlow solid state power switching devices complement the rapid switching required by PID temperature controllers and help deliver optimum system performance and service life. They are available in 1-phase and 3-phase/2-leg and 3-leg configurations, feature touch-safe terminations, input indicators, zero-cross, random or phase-angle fire options, ratings from 18 to 1,000 amperes and agency approvals including CE and UL® 508. Various configurations offer short circuit current ratings (SCCR) of 200,000 amperes, extensive system and heater diagnostic capabilities, heater bake out, integrated heat sinks, on-board fuses, RoHS compliance and serial communications. Watlow DIN-A-MITE® and E-SAFE II power switching devices provide convenient DIN-rail mount packages and are a good replacement for mercury displacement relays. Additionally the EZ-ZONE ST offers an integrated temperature and process controller with optional over- and under-temperature limit and safety shutdown contact. 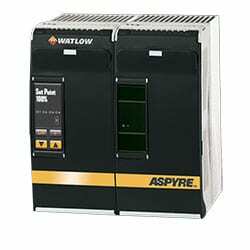 ASPYRE® SCR Power Controllers Watlow’s new ASPYRE SCR power controller family is flexible and scalable, and available with a variety of options allowing one platform to be re-used across a wide range of applications, which can help save time and money. ASPYRE models available include sizes from 35 to 700 amps. This power controller family features multiple advanced microprocessor-based firing and control mode algorithms. Combined with diagnostics and several communications options the product enables equipment and factory automation. Controller firing modes include zero cross, burst firing, single cycle, delayed triggering and phase angle. These smart algorithms enable the product to easily control a wide base of heater loads including Nichrome®, moly, silicon carbide, tungsten quartz and infrared lamps and transformer-coupled loads. ASPYRE offers a comprehensive list of modular options that deliver space and labor savings including controlled legs (1, 2 or 3), semiconductor fusing, load current measurement, amperage size and user interface. The DIN-A-MITE® A power switching device controller is designed and manufactured with quality features expected from Watlow. DIN-A-MITE A capabilities include single-phase zero-cross switching up to 25 amperes at 600VAC (see rating curve). A unique integrated design removes the guesswork associated with selecting a proper heat sink and adequate terminations for the application. DIN-rail and back panel mounting is standard on this family of power switching devices. The DIN-A-MITE is also mercury free. 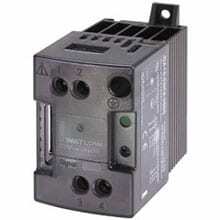 Variable time base, 4-20mA process control or VAC/VDC input contactor versions are available. All configurations are model number dependent and factory selectable. This power controller includes 200KA short circuit current rating (SCCR) tested up to 480VAC to prevent arc flash with required fusing. The DIN-A-MITE® B is a low-cost, highly compact and versatile solid state electric heat controller. The DIN-A-MITE B capabilities include single-phase and three-phase zero-cross switching up to 40 and 22 amperes, respectively at 600VAC (see rating curve). This electric heat controller’s design includes proper heat sinking and terminations simplifying integration into applications. DIN-rail and back panel mounting is standard on this electric heat controller. The DIN-A-MITE controller is also mercury free. Variable time base, 4-20mA process control or VAC/VDC input contactor versions are available. A shorted silicon controlled rectifier (SCR) alarm option is also available. All configurations are model number dependent and factory selectable. This power controller also includes 200KA short circuit current rating (SCCR) tested up to480VAC to prevent arch flash with required fusing. The DIN-A-MITE C silicon controlled rectifier (SCR) power controller provides a low cost, compact and versatile solid state controller option for controlling electric heat. 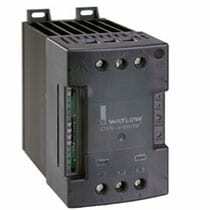 This solid state controller is designed and manufactured with the quality features expected from Watlow. DIN-rail and standard panel mounting plus a cabinet thru-wall mount version are available. Basic features of the solid state controller include single-phase, three-phase/two leg, and three-phase/three leg, 24-600VAC operation. Current switching capabilities range from 30 to 80A depending on the model ordered. Variable time base, linear voltage and current process control or VAC/VDC input contactor versions are available. Single-phase, phase angle firing and current limiting are also available. All configurations are model number dependent and factory selectable. This solid state power controller includes 200KA short circuit current rating (SCCR) tested up to 480VAC to prevent arch flash with required fusing. The DIN-A-MITE® D silicon controlled rectifier (SCR) power controller provides an inexpensive, versatile product for controlling heat in an efficient package. This SCR controller is designed and manufactured with the quality features expected from Watlow. The back panel mounting matches the footprint of the industry standard mercury displacement relay. There is no need to worry about mercury; the DIN-A-MITE controller is mercury free. The DIN-A-MITE Style D is capable of zero-cross switching up to 100 amperes single-phase, at 600VAC at 86°F (30°C), depending on the model selected. Two or three controllers used together can control three-phase. It is totally touch-safe and includes standard back panel mounting, on-board semiconductor fuses (accessible from the front) and a current transformer option for external load current monitoring. An optional “shorted SCR detector” feature is available on some models. This model is UL®508 listed and C-UL®and CE certified. These agency approvals are ideal for those panel builders that require agency approvals on their panels and cabinets. 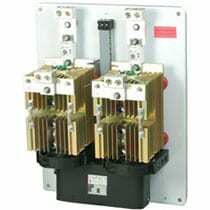 Variable time base, 4-20mA process control, or VAC/VDC input contactor options are available. All configurations are model number dependent and factory selectable. This power controller also includes 200KA short circuit current rating (SCCR) tested up to 480VAC to prevent arch flash with required fusing. 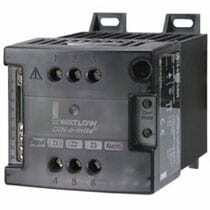 Watlow has manufactured solid state power controllers for over forty years. Watlow’s POWER SERIES™ is a microprocessor-based product that features application flexibility unmatched by any other silicon controlled rectifier (SCR) power and solid state controller on the market today. 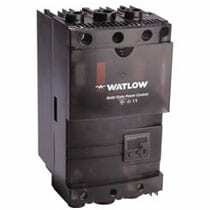 Watlow’s POWER SERIES solid state controllers include single- and three-phase models from 65 to 250 amperes. Field configurable phase-angle or zero-cross firing improves application flexibility on-site where needed. 50/60Hz independent operation allows utilization almost everywhere in the world without special calibration considerations. Serial communication via Modbus® RTU allows setup and monitoring of load status from a computer station or control room. On-board semiconductor fusing improves reliability by protecting the SCRs from heater short circuits. Plus, on-board heater bakeout and control diagnostics can help eliminate initial start up problems. All these benefits are in a touch-safe package that can be quickly and easily mounted in a control cabinet. Watlow’s POWER SERIES solid state controllers are UL® listed and C-UL® recognized, ensuring that they meet world safety and operational standards. The QPAC modular controller from Watlow is a modular silicon controlled rectiﬁer (SCR) power controller with plug-in features for ﬂexibility. Bases are rated from 150 to 1000 amperes in one-phase, three-phase, two leg and three-phase, three leg configurations. A variety of transformers from 120 to 575VAC, along with 50/60Hz operation, enable the QPAC modular controller to operate in applications anywhere. Plug-in control cards set the QPAC’s SCR ﬁring modes: solid state contactor, burst ﬁring (zero cross) or phase-angle models and are available with a wide variety of options. 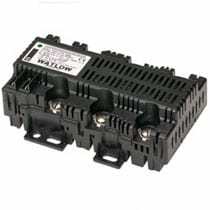 High speed fuses are included to protect the SCR modular controller from short circuit currents. 200KA short circuit current rating (SCCR) prevents arc ﬂash. The SERIES CZR solid state relay provides a low-cost, highly-compact and versatile solid state option for controlling electric heat. With DIN-rail and back panel mounting standard on every controller, the CZR solid state relay allows for simple and quick installation. The extensive capabilities of the SERIES CZR include single-phase, 18 to 42 ampere zero-cross switching up to 600VAC (see output rating curve). It’s unique integrated design removes the guess work associated with selecting a proper heat sink and precise terminations for the application. This solid state relay controller holds many agency certifications and is ideal for applications that require UL®, CSA and CE approvals. The SERIES CZR is available in VAC/VDC input contactor versions and all configurations are model number dependent and factory selectable. 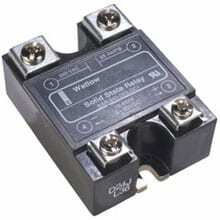 The SERIES CZR solid state relay is protected by a two-year warranty. 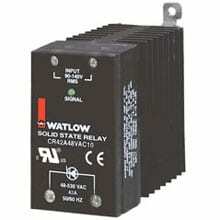 Watlow solid state relays (SSR) offer many of the advantages of solid state power controllers, but at a lower cost. Watlow’s extensive knowledge in power controller design led to the development of a special fast cycle input card that enables a solid state relay to operate from a standard 4-20mA instrumentation command signal. Test results show that zero-cross solid state relays in combination with the fast cycle card promote better temperature control and longer heater life than slow cycle relays. Through a time proportional cycle rate of 1⁄10 of a second, heater life will be extended. Both low and high voltage solid state relays are available from 24 to 660VAC. All ac output models include back-to-back silicon controlled rectifiers (SCRs) for a more rugged design than the traditional triac-based solid state relay. The internal design allows it to tolerate high currents and harsh electrical environments of heavy industry. 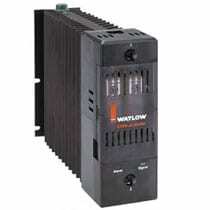 Watlow also offers a switched VDC model for dc heating applications. Watlow provides all of the components necessary for trouble-free operation. This includes two standard convenience items: a thermal foil to ensure proper thermal transfer from the relay to the heat sink and belleville washers to ensure that the relay is mounted with sufficient pressure to enable good heat transfer. Matched semiconductor fuses and heat sinks are available to complete the power switching package.